November is National Novel Writing Month (NaNoWriMo) and the challenge is to write a novel. In one month. It sounds a little crazy but we’ll never know if it’s possible unless we try. And if we don’t quite make it to a polished final draft, does it matter? We’ll be well on our way to a huge achievement – that’s how I look at it. 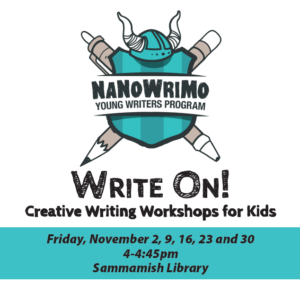 I’m running weekly classes at Sammamish Library in WA, 4pm-4.45 each Friday. If you’re 8 to 12 years old and itching to get that first (or second or third) novel under your belt, come along. We’ll experiment with tips and tricks and techniques to get as far down that path as possible.